Ladaa is a 36 year old weaver from the Karen ethnic group who was born and lives in the village of Mesapok. Her aunt taught her to weave when she was 12 years old and she has enjoyed doing it ever since. She has never been to school and works with her husband as a subsistence farmer when she is not weaving. She has one daughter and one of her favorite memories is when she was teaching her how to weave. Her dream for her daughter is for her to grow up to work as a trekking guide, because she will be able to earn a good income and stay close to home. Lahay is a 27 year old weaver from the Karen ethnic group who was born and lives in the village of Mesapok. She has been weaving since her mom taught her at 13 years old. She has only ever been to preschool, and when she is not weaving she is a subsistence farmer. She has a small shop in Mesapok where she sells craftwork and teaches weaving workshops to tourists. She is a naturally talented business woman, and her favorite aspect of being able to weave is her ability to provide income for her family. She has a young daughter who she dreams will study hard and grow up to get a good, stable job. Midamo is a 40 year old weaver from the Karen ethnic group who was born and lives in the village of Mesapok. She has been weaving since her mother taught her at age 8. These early moments of learning the craft as a child were some of her happiest memories, because she felt proud that she was able to accomplish such skilled craft. To this day, her favorite things to weave are scarves. She has never been to school and her only source of income is from weaving, otherwise she is a subsistence farmer and takes care of her two buffalo. She has a son and a daughter who she loves very much. Her dream for her granddaughter is for her to study hard and to get a good job. Birdimo is a 54 year old weaver who was born and lives in the village of Mesapok. She has never been to school, and spends her time weaving and subsistence farming. Weaving has always been an integral part of her life, starting when her mom taught her to weave at age 12. Her favorite memory of weaving is when she was making clothes for her husband when they were first dating. Currently her husband is out of work, so she is the sole provider for her family by selling her weaving. Additionally, several years ago one of her two sons died. Following his death, she became the sole caretaker for his two daughters who she loves very much. Her granddaughters are 7 and 14 years old, and she has already taught both of them to weave. Her dream is for them to get good grades and graduate from high school. 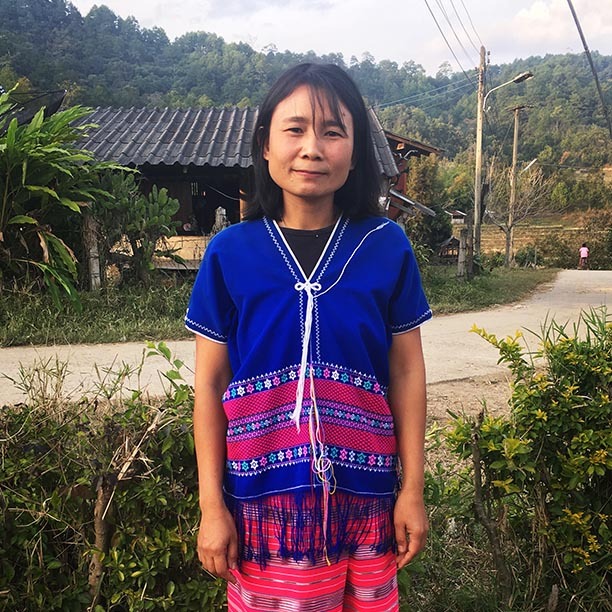 Lana is a 34 year old seamstress from the Karen ethnic group who was born and lives in the village of Bankloy. After graduating high school, she learned sewing as a way of making income while caring for her two children. Due to health complications that prevent her from working in agriculture, sewing is the only opportunity she has to help support her family. One of her favorite sewing projects she’s created was when she started experimenting with up-cycling blankets to make colorful jumpers for her children. No matter what happens in life, her dream for her daughter and son are that they grow up to be good people.